Each Geronimo Stilton book is fast-paced, with lively full-color art and a unique format kids 7-10 will love. 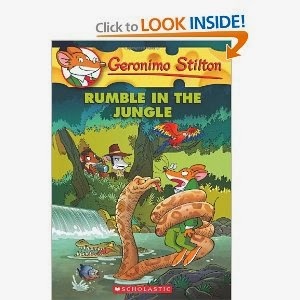 I, Geronimo Stilton, was off to the wildest part of Brazil, the Amazon jungle! I ended up on a hunt for an rare crystal treasure, which was stolen from a native tribe in the heart of the forest. I'd encounter alligators, snakes, piranhas and other dangers on my way. Holey cheese! What an adventure!